For decades the feat was romanticized as a flawless success, but with the end of the Soviet Union, a different picture surfaced, one where a high stakes space program gave the first man in space a very close brush with death. Six months before Gagarin’s brave “Poekhali!” from his seat in the cramped Vostok, a Central Committee decree ordered that the launch be set for December 1960 - in just two months’ time. But then, on October 24, a fully charged rocket exploded on the Baikonur launchpad, taking 268 lives. Almost all the country’s top rocket scientists burned alive. By the end of 1960, the program had a 75 percent failure rate on its space launches. Belka and Strelka, the two space-dog heros that survived their ordeal are well-known, but several animals perished either during unsuccessful launches, or descents that were too steep. It seems in retrospect that Gagarin was chosen based on his ability to take these dangers in stride and not doubt the mission. “We started to test the space suits. In preparation for the space flight, every cosmonaut had to check his outfit on the ground. Each had to wear it for many hours. Gagarin tested it first. He sat in the ship’s cabin. He also slept and ate there. - Yevgeny Karpov (pseudonym Yevgeny Petrov) Cosmonauts. The dangers Gagarin faced on his descent came to light after secret documents appeared in the 1990s. Many of these were later sold at western auctions, as lax control over space paraphernalia allowed it to trickle out of the country with only a Ministry of Culture permission. Commander Yevgeny Karpov’s notes, kept during Gagarin’s flight, are peppered with words like “malfunction” and “emergency.” Near the end of its orbit around Earth, Vostok gyrated violently, and the rocket’s third stage and service module separated only with difficulty. Many of Gagarin’s colleagues said that actually Gagarin was tested less by the flight itself than by the years of fame and regalia that followed; the attention weighed him down more than any G-force test. Gagarin repeatedly asked to fly again, but the party leadership deemed him too valuable for that. So for the next seven years, there were speeches, banquets, and hunts with party officials. Then, Yury Gagarin, who had received permission to recertify as a fighter pilot, crashed in a forest near Kirzhach, Moscow region. Despite multiple investigations, the circumstances of the crash remain unclear to this day. His ashes, and that of his on-board flight instructor, Vladimir Seryogin, were buried in the Kremlin Wall. 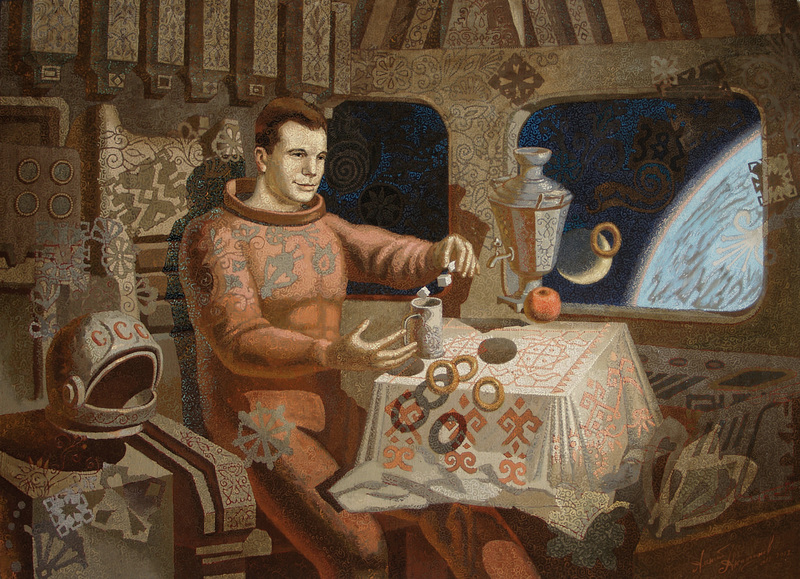 I soon was convinced that choosing Gagarin was truly the so-called golden apple. Not primarily in consideration of the flight itself, but of the post-flight activities of Gagarin, a senior lieutenant from a provincial garrison who did not break or even bend under the weight of global fame. People were attracted by his smiling, positive attitude, his modesty and very common appearance, even his inclination to play some kind of simpleton (when in reality he was not a simpleton, but a man of great natural intelligence, who soaked up everything like a sponge). In terms of the propaganda effect of the first flight of man in space, Gagarin’s personality contributed to this as could no other. This was the cosmic traveler that had to be brought before the world. Gallai participated in preparing the first team. The quote is from his book I Thought All Had Been Long Forgotten. A decree of the Council of Ministers dated 6 days after Gagarin's flight, according to which the pilot is to be given a new Volga car [yet he also got this cooler car] and a four-room apartment. And all sorts of clothing is given to his wife, children and parents. A telling document of the disparity between the Soviet Union's achievements in space and its inability to deliver appropriate quantities of consumer goods. A version of this article originally appeared in the Mar/April 2011 issue of Russian Life, under the title "50 Years in Space."